A while back, a minor celebrity–an entertainer with a history of narcissistic behavior–did something public that offended thousands of people. He made a Facebook post complaining about his wait in a hospital emergency room, and he berated all of the employees who didn’t put his needs first. (For the record, he didn’t wait much more than an hour before he stormed out and made his complaint.) He went on about how important he was, and how his needs should be put ahead of other people in the emergency room, then he shamed the hospital staff for not realizing his job meant that he deserved faster treatment because he had things to do. The public was horrified! His job makes him more important than others?! His health needs are more important?! The rest of the people waiting didn’t matter as much?! Hey, maybe we aren’t all famous, but all of us have things that we want to do instead of sitting in the ER. The guy’s post was arrogant and entitled; however, it would have been reasonable to expect that maybe he was just fussy due to his illness. But he didn’t stop there…. Some of his fans commented, (very politely,) that his post was not fair to others. He immediately retaliated against those fans with name-calling and nasty behavior. He wasn’t willing to open his mind and see how rude he’d been. Instead he attacked his fans that called him on it, told them off, and banned them from his page. 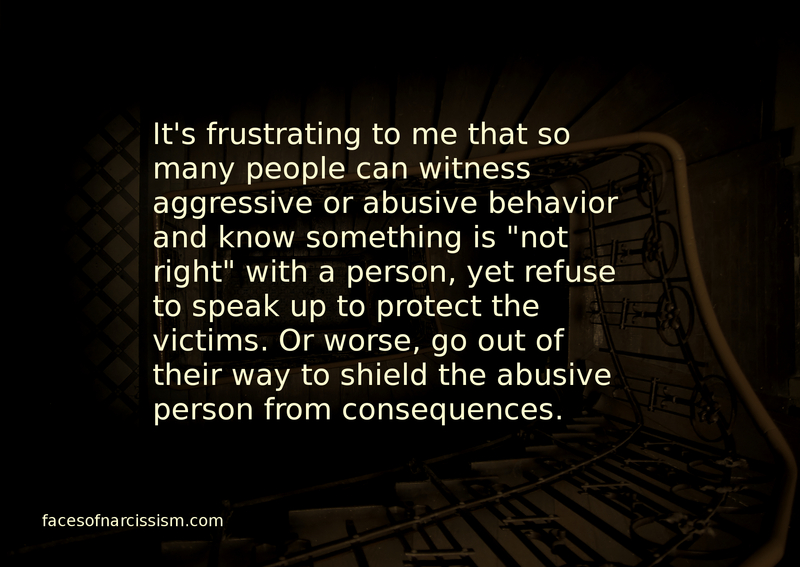 In my opinion, it isn’t necessarily the nasty behavior that proves a person has a narcissism problem; it is their response to being held accountable. I don’t know this person, but his words sure did point towards a narcissism problem! Of course, many of his other fans supported him, and agreed that he deserved special treatment. They made excuses for, and rationalized his behavior, even when he continued being nasty for a few days. Some of my friends and acquaintances and I discussed the debacle, and talked about the obvious narcissism from the minor celebrity. I took the opportunity to try to educate people about narcissistic behavior, and how we all need to be aware instead of just letting it continue. Others agreed and we analyzed the situation and how it is becoming worse with the population. But, other people did not want to talk about it. They kept saying it wasn’t worth talking about, it was none of our business, it was a boring topic. A favorite cliche was to complain about beating a dead horse. 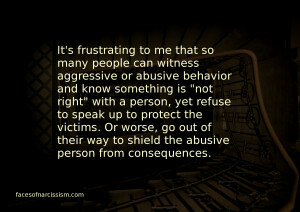 And that’s how society enables narcissistic and abusive behavior! Too many people don’t want to bring it to light or discuss it. Instead, they want us to hush hush and keep everyone quiet and comfortable with all the problems hiding under the surface. If we don’t talk about it, some people think it will go away. But it doesn’t! It just gets worse!